This partnership requires a one-off amount to enable Pastor Bob and his wife to re-establish their tailoring and materials business after it was destroyed in the post-election violence. 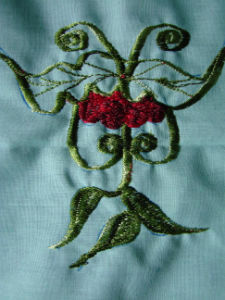 They need to replace an embroidery machine, table, chairs, and materials. It is by this means that they become self-supporting in their ministry for God. 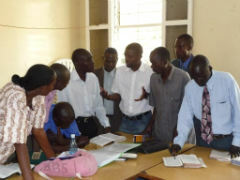 Bob Abdalla is a church planting pastor in the west of Kenya near Kisumu, Lake Victoria. He was introduced by BHW to Harvest Partnership who have trained him and his leaders to plant multiple churches based in houses. In the Kenyan post-election violence in 2008 they had to leave their home and both their house and his wife's materials and tailoring business were destroyed. One lady in their church was shot and about five other people disappeared (presumed dead). In fact during that time they were unable to go to church because of all the corpses. Their church is made up of people from all different tribes and all those from Kikuyus were taken to a police camp. Bob's wife was injured in the violence and most people were in fact killed by the police. The violence and destruction was relentless - they even stole the railway lines - and it went on for three to four months. Everybody was rioting and people were forced to participate. Harvest Partnership approached BHW in mid 2009 for help to re-establish their business as its destruction took away their only source of income. This business provided 50% of their household income. They are managing to do a bit of work from home but the income is only about 20% of what they need. This project directly benefits Bob Abdalla and his wife. By enabling them to re-establish the tailoring business, they will once again be able to be self reliant as this business provides enough money for them to feed themselves and provide an education for their children. Pastor Bob is a zealous and dedicated leader. 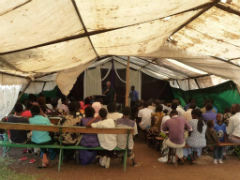 His main church meets in a tent that is raised and lowered each Sunday. They are establishing many house churches both in the town near the Kisumu airport and also in hill country villages half a day's journey away. His wife, inspite of a recent road accident, is willing and able to run this business which will meet their personal and family needs, thus freeing Bob to focus fully on the development and outreach of the church. 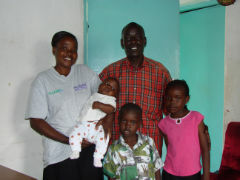 Bob Abdalla is married to Lilian and they have three children, one girl and two boys. Their youngest boy was just born in early August 2009, six weeks before the above photo was taken. To re-establish Lilian's materials and tailoring business so they are once again able to financially support themselves and enable Bob to continue his ministry as a church planter/pastor. This partnership requires one-off support of US$1,210 to get the business up and going again. At that stage they will once again be self-supporting. This partnership has been funded by a family in New Zealand so no further funds are now required.